20 September 2007... 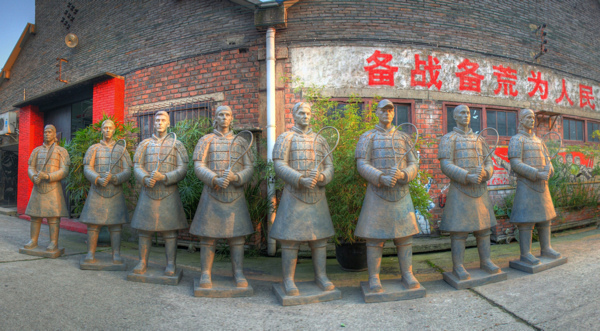 I was contacted in early May 2007 by an account manager from PR & Marketing firm Hill&Knowlton (Soho Square, London), for a commission on behalf of ATP and the Tennis Master Cup Shanghai organizers: the idea was to create a series of Tennis Terra Cotta Warriors sculptures to be used for the worldwide promotion of the upcoming Tennis Master Cup event in Shanghai, China (11-18 November 2007). Brilliant concept - and I was passionate to get onboard!!!! I wasn't new to sport sculpture, having created the lifesize figure of an Olympic medallist boxing champion last year for a city in Ireland. And I've spent almost 2 years in China over the last 6 years (if I add up all my trips and stays here), so starting to be very familiar with ancient Chinese sculpture. After a number of e-mails exchanged, telephone calls and meetings with both Hill&Knowlton and ATP, I was formally commissioned. I then travelled at the end of July to the Rogers Cup in Montreal (Canada) where I photographed and measured all top 15 players in the world (so I'd have the info required to make the sculptures as and when 8 of the 15 would qualify for Shanghai). I met with all of the then ranking first 15 players, including Richard Gasquet (of interest to me because I'm French), and the Scot Andy Murray who is the tennis hero of my country of residence (Great-Britain). While I took my photos and measured away (from every possible angle around their faces), and kept records of this data, the players and I were being photographed and filmed. See some pics of that , plus watch videos of players being interviewed about their hopes for Shanghai 2007 on the ATP and Tennis Master Cup Shanghai websites. 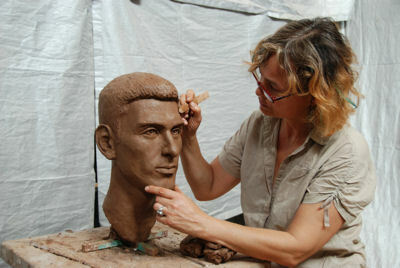 showing Roger Federer and Novak Djokovic being measured by me In Montreal, and being interviewed, as well as my team and I working in Chonqging on the first Tennis Terra Cotta Warrior, Roger Federer, and Rafael Nadal's portrait / bust in clay. Meeting all these players - albeit briefly, and doing this, was a great privilege and lots of fun, plus... I was able to see a bit of what things are like "backstage" at a major tennis tournament! I'd already secured the assistance of my Chinese sculptor friends in Chonqging, husband & wife team Zhang Yaxi and Shen Xiaonan, and had asked them to get things ready for me as there was/is a serious time crunch... In fact the timing of the whole project is a real challenge since players will continue to qualify until just before the event in Shanghai! 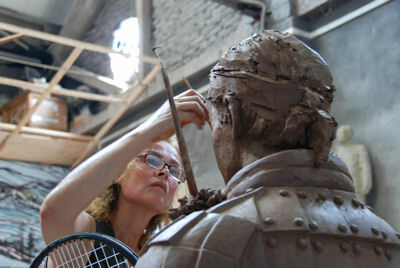 After a short visit to Alaska for another commission, I flew to Chongqing where I worked with the two of them, plus a bunch of assistantson the initial Tennis Terra Cotta Warrior statue in clay (one "master" body is being used for all 8 players that qualify), and on the first 3 busts of Federer, Nadal and Djokovic. The above shots were taken by various Chinese students while I was working in our Chongqing studio with Yaxi and Xioanan in late August and early September. 15 October... 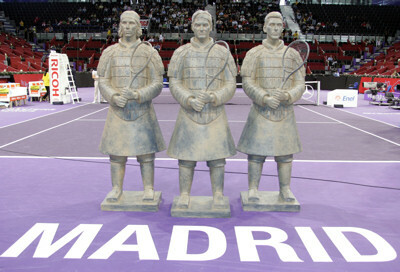 The first 3 Warriors were flown ten days ago by air cargo to Madrid for the Mutua Madrilena Master Series event there. I arrived in Madrid on the 10th. 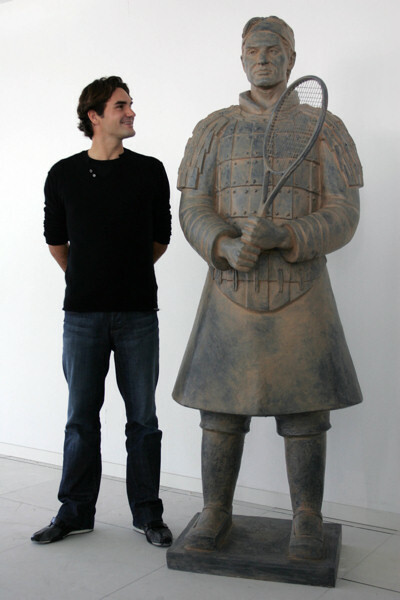 On Saturday 13th, there was an unveiling to the press of Roger Federer's sculpture. 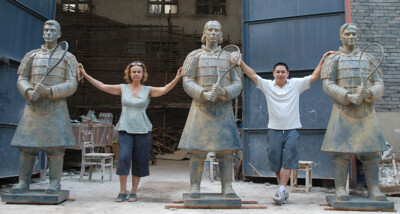 And on Sunday 14th, another unveiling with Rafael Nadal, and a display of all 3 Tennis Terracotta Warriors center court !!! 3 November 2007... Have now completed #1 through #7 Warriors (Federer, Nadal, Djokovic, Davydenko, Roddick, Ferrer and Gonzalez). 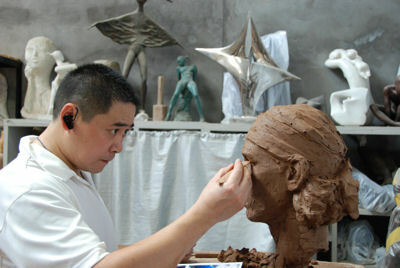 Am awaiting word from the ATP to find out the identity of the player who will rank as #8 in the Shanghai race... so you can well imagine I'm on tenterhooks as Xiaonan and Yaxi and I then have to create his bust made in clay, cast in resin and mount it onto his Warrior body prior to patinating the resin bust after tomorrow. Then we need to get all 8 Warriors shipped out from Chongqing to Shanghai on the 6th of November!!! Two days ago we were interviewed by the Chongqing Morning Post and Sports Illustrated China who had found out about our project from the Tennis Magazine cover story (Chinese edition). This shot was created by our friend David McBride who is a keen photographer and teaches animation at the Sichuan Fine Arts Institute. We didn't have the time to line the Warriors up in any particular order, but they looked great against one of the walls of the Tank Loft Contemporary Arts Center in Chongqing where our studio is located. David took this in several timed images and did his magic... so the wall look curved rather than straight! You can click here to view it at a larger size. 5 December 2007... It's all done and dusted. We had a great time at the unveiling of the sculptures center court during the opening entertainment preceding the first match which featured Nadal and Gasquet. 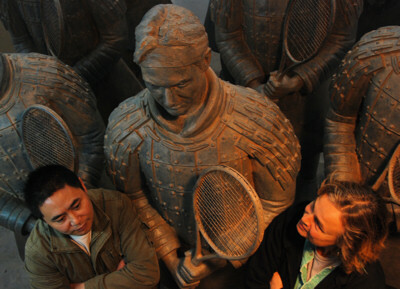 The public attending the Tennis Master Cup at Qi Zhong Stadium loved these sculptures and took turns having their pictures taken with their favorite player statues! Both Chinese and international press gave the sculptures and the tournament a great deal of coverage (see some excerpts or images of magazines covers via this link or via individual links at top of page). The Tennis Warrior statues arrived in England yesterday where they will be exhibited by Wimbledon Museum (the tennis museum in England) through mid-2008! 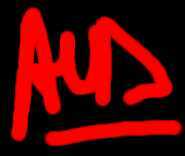 Please note: since all visual records officially belong to the ATP, I am grateful to be able to use them here and request they not be downloaded or used without the express permission of the ATP.